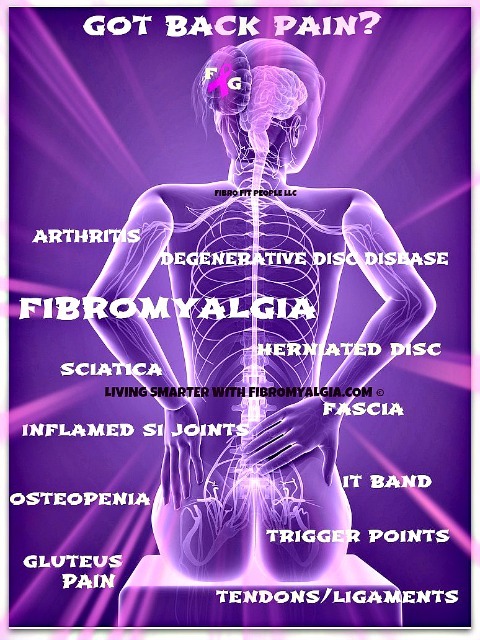 If you have fibromyalgia, then you have likely experienced fibromyalgia related back pain. With many nerves and muscles in the back and around the spine, this is a vulnerable area for anyone but especially those with fibromyalgia and chronic pain issues. Chronic pain management techniques are often called for with every kind of back, spine and/or nerve related pain. In fact, because lower back pain is more common today, even in the non-fibro population, it’s no wonder that so many people are challenged with this often debilitating pain. With fibromyalgia, lower back pain is easily exacerbated mostly during activities of daily living. This can occur when trigger points are both present and/or active and radiate pain from the lower back into the SI joints, hip flexors, glutes and pelvic area. The involvement with SI joints on the upper side on the buttocks also radiates pain to the lower back and even into the pelvic area. Sitting or standing for long periods of time can keep these areas tight and radiating. For those with more severe fibro, even shorter periods of sitting can pose the same issue and should be limited, especially with a tendency toward inflammation within the SI joints of the lower back. Although regular chiropractic adjustments can be helpful to keeping the fibro body in better alignment, there are many perpetuating factors that need to be addressed and other chronic pain management tools to be used consistently as well. First, the fibromyalgia patient may have a more difficult time allowing the adjustment to ‘hold’ like a non-fibro body …This can stem from the TRP’s that may be active in the body OR due to ongoing tightness that we refer to in the article on Myofascial Release (Treatment-For-Fibromyalgia-Myofascial-Release). Second, any perpetuating factors such as lack of core strength and/or lack of agility need to be addressed with chronic pain management techniques. Maintaining strength and agility will always be necessary to avoid injury and stress on the more vulnerable areas of the body. For more information on sciatica, refer to our article on sciatica pain. With fibromyalgia, we are more “sensitive” to any kind of injections. If you choose treatments including injections such as epidurals, cortisone or even saline/cartilage injections, it is important to know that the fibro body will likely need more recovery time from the injection sites. That is normal for a fibro patient. However, doctors treating other conditions in a fibromyalgia patient will not always know this. One of the more effective elements to decreasing lower back pain includes core strength exercises, performed slowly and consistently. With chronic pain, it is often overlooked. This can be done in a variety of ways, including in the standing position, with knee lifts and side bends that activate the oblique muscles. Hand weights are also optional with oblique work. These type of exercises are great for people who cannot get down on the floor. Again, strengthening the core in a safe and effective manner is essential for reducing pain in the lower back and SI joints. Lack of strength in the gluteal muscles can also affect pain in the lower back. Weakness in the gluteus area can also exacerbate trigger points in the lower body. Core and glute strength support one another while supporting overall conditioning in the lower back region. 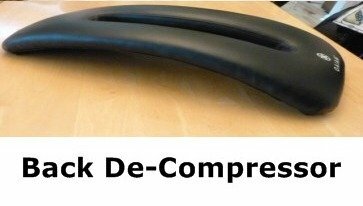 Have you ever used de-compression techniques at your chiropractor’s office? This can be a very helpful component of chronic pain management for lower back pain. The spine tends to get compressed through activities of daily living and by sitting and/or standing for extended periods of time so decompression is an effective tool. We have also found techniques utilizing inexpensive tools that can be used at home. One such tool is a small curved padded device that can aid in de-compression while lying comfortably on the floor or even on a raised table. Available here on this link, this device is called the ‘back wave’. While utilizing any kind of de-compression, it is important to be very relaxed while ‘allowing’ the entire spine to release. It might not feel normal at first. Start with 1-2 minute increments and work up to 5-10 minutes per session. What about the inversion table? An inversion table can also be used for spinal de-compression either at home, at the gym or in the doctor’s office. Go slow when using inversion, especially with any active trigger points in the neck or back area. It has been found that even going just past 50% on the table can be helpful, so going slow and adjusting to the feeling of being inverted needs to be a consistent process. I use an inversion table at home and my recommendation would be to get a good quality table if buying one for home or office use. I have also used them at the Chiropractors office and we now have one at the gym as well, so they are becoming more widely available. I will provide another caution with inversion, but this won’t be an issue until you are going past about 70% inversion. If you have weakness in your ankles, you want to be sure to not only wear shoes while inverting, but also thick socks may be helpful and if you feel too much pressure on the ankles, then come back up as much as needed. A few minutes per day is a good place to start. Again, even at just past 50%, you are taking pressure off the spine. Some people with fibromyalgia and CFS/ME might feel pressure in the head more quickly with inversion. For instance, if you ever feel pressure in your head when leaning down, then this is a warning to go slow with increasing levels of inversion. Another point of consideration and often a perpetuating factor in those with chronic lower back pain is sitting too long first thing in the morning. Do you wake up and sit in front of your computer or TV first thing in the morning? For chronic pain management, it is really essential to get the blood flowing around any painful areas of the fibro body by following my “fitness protocol” (fibromyalgia-exercises) and taking a moderate walk before engaging in other activities of daily living. Avoid prolonged sitting during the first part of the day ..
You might also find my facebook fitness page, Fibro Fit People helpful in managing lower back chronic pain. When we think of posture, we more often think about our upper body and our shoulders, however the posture within our core and lower body is extremely important to pain management. Do you ever find yourself standing with one hip higher than the other, or unaware of your spine? Other perpetuating factors for back pain include sleeping positions and mattress quality. Extra pillows around the sides of the body and under the knees can be helpful. Even a decrease in upper body strength can increase lower back pain when we attempt to lift something unusually heavy. We cannot afford the extra strain on the lower back due to over-compensation and/or ineffective posture. Yes, overall body strength and agility in the fibro body is an essential part of chronic pain management and will always be important to preventing injury and protecting the more vulnerable areas that are susceptible to pain. 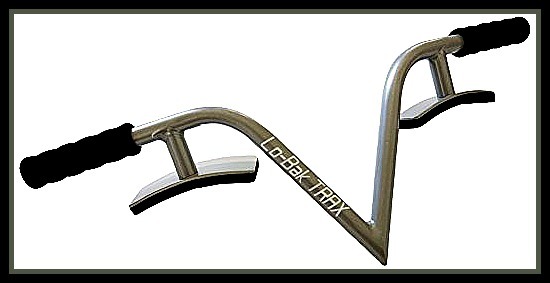 I’ve discovered a new tool for my constant lower back pain which is one of my most troublesome areas of chronic pain; its called the Lo-Bak Trax. I’ve been using this for a few weeks and its helped a lot. I love it. Click on the links and wander on over to Amazon and check it out.